"I'm putting out an APB on the missing "Angela Blogs". Have you seen them?" Fine, Mr. I-Know-How-To-Make-Her-Feel-Guilty. 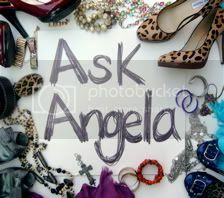 Yes, I know where the "Angela Blogs" are. They're floating around in my head, unable to get out because they keep bumping up against my to-do list. It's like the start of the New York Marathon with all those people running so tightly packed that the lone person standing on the side couldn't possibly squeeze in. That lone person has to wait until the torrent passes and the end of the pack stragglers are making their way by to dash in. So, the Soccer Mom Blog wanted to come jump into the mix the other day, but the runners never tapered out. And then there was the We're-Missing-the-Point-of-What-Being-a-Christian-Means blog. It was a good one that kept trying to elbow it's way into the mass of to-do items flashing by, but never did succeed. The Small-Town-Mentality blog got it's leg cut off by the overzealous errand day last week, and my Sassy Shoe Thursday post that I was not going to let ANYthing get in the way of is still in the hospital bed. No one knows if it will wake from it's coma.